Daniel Goleman, a psychologist and behavioral science journalist, popularized the term and developed related concepts in his influential book, Emotional Intelligence (1995). There are four quadrants to Emotional Intelligence. 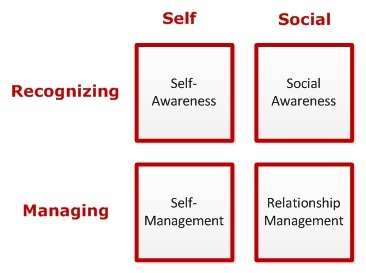 Theses quadrants are composed of two primary competencies and two primary actions. Self-Awareness is the ability to know your emotions, strengths, weaknesses, tendencies, interests, habits, values, hopes and dreams. If you are very self-aware, you understand your emotions, trust your intuition, and are able to manage your emotions. Self-Management is the ability to control your emotions and impulses. If you are able to self-manage, you can control impulsive feelings and behaviors and manage your emotions in healthy ways. Social Awareness is the ability to identify with and understand the emotions, needs, concerns, and perspectives of other people. It is how well you reads the emotions and feelings of other people. Relationship Management is the ability that enables you to communicate well with other people and manage relationships so that they progress in the desired direction. It is how you manage your interactions with other people.